It was one of the longest and most enthralling matches in the history of the Porsche Tennis Grand Prix. 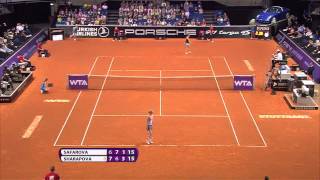 Watched by a capacity 4400 crowd in Stuttgart’s Porsche Arena, Maria Sharapova (Russia) eventually closed out the match after three hours 23 minutes 7-6 (5), 6-7 (5), 7-6 (2) against the battling Lucie Safarova. The world number 26 from the Czech Republic never gave up and resisted stoutly in the face of defeat right up to moment when Sharapova wrapped up the win. It was the first match at a WTA tournament that had gone to three tie-break sets since 2010. The last one was won by Serena Williams (USA) in Madrid against the Russian Vera Dushevina. “It was a match of ups and downs,” said Maria Sharapova. Maria Sharapova and Lucie Safarova also played out a thrilling three-setter last year in Stuttgart. And they did not give an inch today either. Almost every game went to deuce and the Russian led 5-1 in the third set but failed to convert three match points. Lucie Safarova fought back, won five games in a row and was herself only two points away from victory when leading 30-love on her serve. Maria Sharapova now drew upon the wealth of her experience and broke back with nerves of steel to force a tie-break which she took 7-2. “It was a match of ups and downs,” said Maria Sharapova after the memorable match which drew a standing ovation from the audience, “but one simply has to fight right up to the very last point. At the end match like that there’s no game plan any more. All that counts is instinct.” The match marked Maria Sharapova’s 100th win on clay. Porsche Team Germany’s Annika Beck, who played impressively when qualifying for the main draw at the long-standing Stuttgart tournament, lost her first round main draw match against the Italian Roberta Vinci 6-3, 6-2. “I would have like to have made it a bit closer,” said Beck who, aged 20, is the youngest participant in the tournament. She continued by saying that, “I was lacking a bit of bounce in my legs after qualifying.” Playing alongside fellow Germany Kristina Barrois, she has however advanced to the second round of the doubles after winning 7-6 (0), 1-6, 10-5 against Eleni Daniilidou (Greece) and Mirjana Lucic-Baroni (Croatia). Great performance from Angelique Kerber and Andrea Petkovic in the doubles. Every year, the world’s best female tennis players meet in the Porsche-Arena. The Newsroom takes a look behind the scenes.